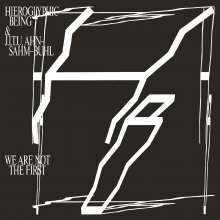 Der Artikel Hieroglyphic Being & J. I.U Ahn-Sam-Buhl: We Are Not The First wurde in den Warenkorb gelegt. For those who maintain the more mutable dance music is, the deeper its impact on human evolution, RVNG Intl. presents We A re Not The First, an Epic conducted and deconstructed by Chicago artist Hieroglyphic Being and the J. I.T. U. Ahn-Sahm-Bul. We Are Not The First combines the musical forces of Marshall Allen, Daniel Carter, Greg Fox, Shelley Hirsch, Shahzad Ismaily, Elliott Levin, Jamal Moss, Rafael Sanchez, and Ben Vida in deep dialogue with each other and humans' hidden sonic history. Tracked as different personale patterns over a week of studio sessions in Brooklyn, said syntax translates into mesmerizing sound forms as the ensemble excavates sonic folklore and ancient music, employing spiritualjazz's welfare and health as an agency for balance. An album with an active brain, We Are Not The First as pires to reprogram the mind, to transcend our expectations through bugged-out percussion, modular mayhem, flurries of free improvisation, and voices carrying through the air. Hieroglyphic Being & J. I. T. U.. Ahn-Sahm-Bul develop consciousness from primordial ooze. As in listening, the ooze intones an echo of our deep past, rendering the present ever focused. We Are Not The First is an 11-part Epic and each track is a movement therein that testifies: an ensemble's vitality lives in its collectivity. When we ask the ooze, the ooze articulates: We Are Not The First.